Cardboard Piano at the Park Square Theatre is a powerful drama about love, human cruelty, redemption and forgiveness. 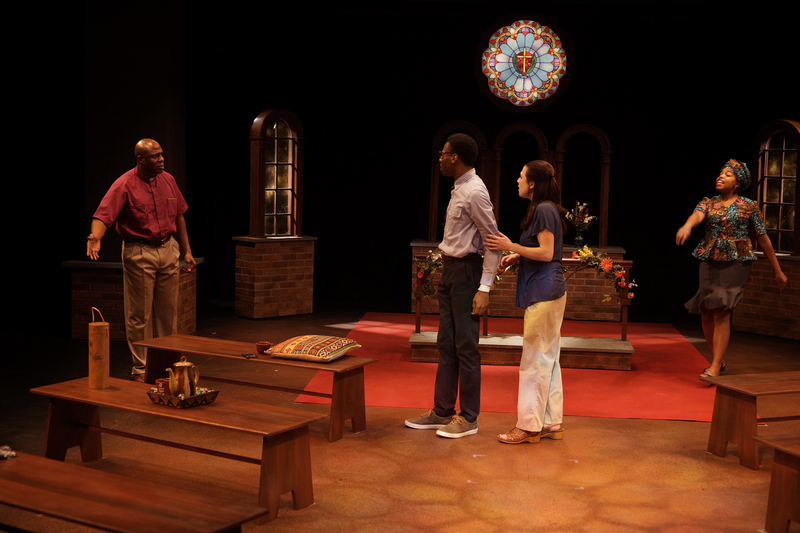 The play’s themes stand in stark contrast to the happy Winter Carnival and Super Bowl festivities taking place now in the Twin Cities, but they are timely and profound. The four actors, who play seven characters, are amazing. Kiara Jackson (Adiel/Ruth), in particular, gives a bravura performance and transforms so thoroughly into her characters that she completely blurs the lines between reality and illusion. The play is set in a township in Uganda on the eve of the millennium in 1999. Two teenagers, one a local Ugandan girl, the other the American daughter of white missionaries, hold a secret wedding ceremony. They are in love and, despite fierce opposition to that love from parents and society, are determined to be joyful and committed to each other. The real world of war, violence and hatred intervenes and the two suffer the consequences of aiding a child-soldier desperate for their help. Adelin Phelps (Chris) also delivers a powerful performance as a young woman ready to buck convention, protect her lover and survive the traumas she endures. Ansa Akyea (Soldier/Paul), as the adult version of the child-soldier, conveys convincingly the psychological scars of that Ugandan tragedy. Rounding out the cast is Michael Jemison (Pika/Francis) whose performance also packs an emotional punch. The play’s emotional arcs leave you teary-eyed and moved so deeply that you will think about the performance hours afterward. Despite the heavy themes, the play offers many joyful and playful moments of dialogue. I wholeheartedly recommend Cardboard Piano to anyone willing to experience the redemptive cycle of love and forgiveness in this thrilling production. Cardboard Piano by Hansol Jung, directed by Signe V. Harriday. Now through February 18 at Park Square Theatre, Andy Boss Thrust Stage, Historic Hamm Building, 20 West Seventh Place, St. Paul. Tickets at 651.291.7005 or www.parksquaretheatre.org.